The Cat Bed you put in your window~!! Installs in seconds on glass doors or windows! Give your cat the best seat in the house!! 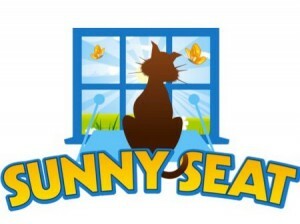 Cats love sunshine and looking at the outdoors! 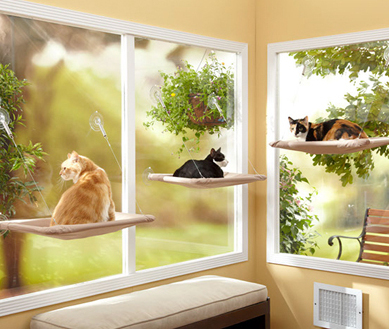 I was really nervous about putting this up for my cats...it comes with four huge suction cups that stick to your window (make sure the surface is clean). The specifications stated that it would hold up to 40 lbs. My cats are not that big so the weight restrictions didn't worry me, it was the suction cups, they never seem to work for me properly, however, they STUCK and HELD...that truly surprised me!! Saqqarra Cowcatta just LOVED the Sunny Seat Cat Bed...she was primping and preening on it for hours, stopping EVERY once and a while to look at something outside that caught her attention. Her little ears perk up and her head is moving back and forth like she was at a tennis match!! LOL...it was too funny!! I was surprised my Mary Magadelen Leopardo didn't want anything to do with it...she's always lying in my kitchen window and I thought she would really get a kick out of it, but she seems fine with allowing Saqqarra to have it as her perch!! I'm thinking Mary is afraid of falling...she has a habit of falling off her perches while she is sleeping...hehe...my poor li'l girl!! I'm not all that mechanical and the set up was a little daunting at first...the instructions weren't as clear as they could be for folks like myself. However, I trudged on and put it together, but it took me longer than seconds ...hehe...more like half an hour!! I had to put my cats on the bed to begin with...they just didn't get it at first...Mary jumped off promptly and Saqqara hung around on it for hours, and returns to it daily! I'm thinking if you have cats that you adore, then this is one gadget you MUST get them...they will surely enjoy it and have their own "special" place to be themselves!! I'm just waking up...what do you expect?